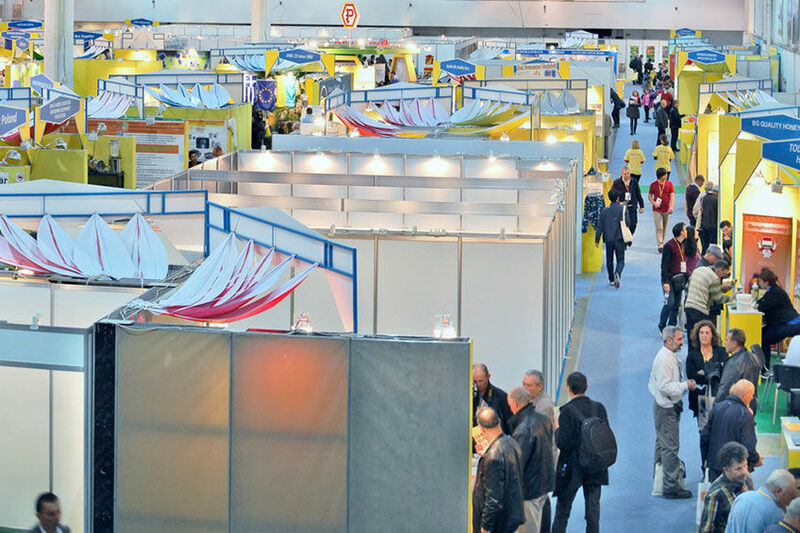 Trade shows are often the source of your hottest, most qualified prospects. Unfortunately, a lot of attendees come back to the office with far fewer leads than they should. Or they come back with a bunch of unqualified leads that were never a good fit in the first place. The secret to getting better quality leads and more of them at trade shows is treating each show like it’s just one step in your sales process. Don’t approach a trade show like it’s an isolated event. Instead, have a plan in place that covers before, during, and after the show. So what should you do to make sure you come back from the event with as many good sales leads as possible? The more promotion you do for the event, the better. In the months leading up to the show, you want to let people know you’ll be there. Update your website to let your site visitors know about the trade show you’re attending. You can maintain an events page like this or do a blog post about the show. Post your booth number. Mention any pre or post show events you’ll be attending. If you’re doing a giveaway at the show, highlight it. Monitor blogs and social media for mentions of the show. Search Twitter and Google for the name of the show. Set up Google Alerts to be notified when the event gets mentioned online. Reach out to the people who are talking about it. If you have a print or email newsletter, do a profile of the event. Get readers interested. Encourage people to meet you there. A direct mail campaign targeted at current prospects and customers can be another effective way to get more inquiries and traffic to your booth. A simple postcard is all you need. Re-engage with people you’ve met at previous events. Give them a call or send them a quick email. Find out if they’ll be at your upcoming trade show. A trade show is a sales opportunity. Send salespeople. Attending trade shows is not an excuse to get out of the office for a little while or have lunch on the company dime. If you send the wrong people or if the people you do send approach it like a working vacation, you’re wasting time and money that would be better spent elsewhere. Some of the best leads you’re likely to find will be at the event. Don’t send staff members who don’t have sales training to talk to these prospects. Some companies will staff their booth with models, administrative assistants, or interns. Don’t make that mistake. Collecting leads has to be fast and easy for booth visitors and your sales team. You can usually rent lead collection software and hardware from trade show organizers if you need it. You might need time to familiarize yourself with whatever system you rent so allow for that. You can also use third party tools to swipe or scan attendee badges directly to a laptop or tablet. Have multiple lead collection stations in place. Make sure you have a backup plan for collecting leads in case something goes wrong. You don’t want interested visitors leaving without you recording their contact details as well as their answers to your qualifying questions. In order to capture solid leads, you need to separate the suspects from the prospects. At the same time, you also want to highlight the benefits of your product to the qualified prospects. To do this, define your trade show sales process. Make sure the people you send understand it before they leave for the event. Politely ask to scan the visitor’s badge. Politely disengage from unqualified suspects. Demonstrate your product to qualified prospects. Get a commitment to take an appointment, call, or other follow up communication. Build rapport with a friendly question or two before moving to the qualifying questions. For example, ask what brought them to the show. Don’t ask yes or no questions when you’re trying to break the ice. You’ll end up doing all the talking. To qualify your visitors, find out the person’s role in the buying process. Determine which of your products they might be interested in. Try to find out what their budget is and when they’re looking to purchase. Set a target number of qualified leads to obtain. Offer an incentive to your team for exceeding that number to keep them focused and motivated. Some companies will pass out literature or promotional items without even getting a first name. You’ll likely see handouts littering the trade show floor or filling up trash bins. Instead of focusing your effort on giving out as many brochures as possible or handing out all of your trinkets, concentrate on getting contact details and answers to your qualifying questions. Bring some product literature, but keep it out of reach. Only actively pass it out if you have a specific goal, such as building awareness of an upcoming product or purchase incentive. If someone insists, get their contact info first. Try to get answers to questions about their needs before you hand them anything. You could even skip the brochures entirely. If pressed for literature, offer to email an electronic copy or snail mail your printed materials so they’ll have them when they return to their office. You can email literature requests back to someone at your office for fulfillment while you’re at the event. Giveaways can be a good way to generate buzz for your company. They can also generate a lot of dead-end leads if you’re not careful. If you’re giving out free stuff in exchange for contact info, separate the people who are interested in your product from the ones who are only interested in the prize. If everyone drops their business card in the same fishbowl, your sales team will end up wasting time calling on bad leads. Make sure you have your post show sales process mapped out before you leave so you can follow up as soon as you get back. Contact your new leads as soon as possible while you’re still on their minds. Maximizing the number of good leads you capture will go a long way toward achieving a positive return on investment in the trade show. But getting a lot of good leads into your pipeline is just one of your goals. What happens after you get back is what determines whether attending the show was a success or not. So don’t drop the ball. Keep working your process.